ARMEDIA » Rattler turns 100! 25 years is a long time in anyone’s language. A child born in 1987 is now an adult and many things in our world have changed. In this our 100th edition, Eddy Jokovich and Ingrid Maack look back at Rattler’s advocacy roots and editorial policy of rattling the cage! In publishing terms, producing 100 editions of a magazine over 25 years is the equivalent of going to the edge of the universe and back. Publishing is an incredibly fickle field and to provide an idea of how tough it can be, of all the magazines that were launched in 1987, only 5 per cent still exist. Of all the magazines that were being published in 1987, 90 per cent have disappeared. In 1987, a publishing revolution commenced—production that previously required large-scale machinery and many staff to layout and produce a magazine, could now be published on a small computer that could sit on a desk, hence the phrase ‘desk-top publishing’. The Board of Community Child Care Co-operative of NSW at the time agreed that it was important to have a publication as a way to communicate its own stories and information about all the many issues that were taking place in the sector. It was decided that the magazine be called Rattler—a dual meaning, according to the minutes from 1987 in which it was proposed that the magazine’s reason for existence would be ‘to rattle the cage, to make noise, like a kid’s rattle, and be heard’. Although this seems an unambiguous title, we did once receive an enquiry about whether the magazine had anything to do with American snakes. ‘Try saying, “the Community Child Care Newsletter” ten times quickly and you’ll see why we decided to change it to something short, relevant and memorable. For a quarter of a century, Rattler’s most important role has been to act as an advocate for what is in the best interests of children and what is in the best interests of early childhood teachers and the professionals that care for children. Over the years, Rattler has tackled many of the big issues that have confronted the sector and, indeed, has rattled the cage on many occasions. Rattler has never been afraid to confront those that act against these interests. The transformation of early childhood education and care to a recognisable profession has been well documented within our pages over the years. And the shameful practice of holding children in immigration detention, a practice that still continues to this day, was roundly condemned with a series of articles in the early 2000s. Railing against the removal of operational subsidies by the Howard Government in 1997 was another. Rattler strongly argued over many years that corporatised childcare was not in the public interest and we believe that we were finally vindicated collapsed in 2009. So, while these are some of the big issues affecting the overall sector, Ratter also promoted many successful campaigns that directly affect educators, including improving working conditions, better staff–child ratios (1:4 Make It Law), and the pay equity campaign. 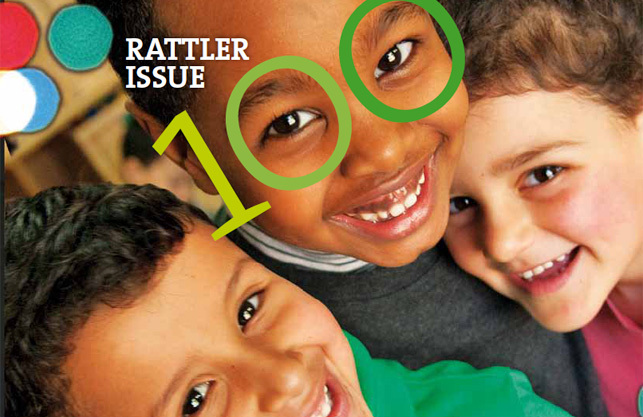 Within this ‘big picture’, Rattler has also provided information about the many factors that influence the quality of each and every service—better quality menus, playground design, contemporary educational research, reviews of books for children and educators, music and drama for children, programming and policy development, behaviour management, working with management, Aboriginal and Indigenous issues, environmental awareness, multiculturalism, occupational health and safety, risk assessment, legal issues, the effects of new technologies on children, special and additional needs… an endless list! And, of course, the many profiles and close-ups that we have had with many political leaders of all persuasions (even one Governor–General), children’s services leaders, academics, authors, educators and activists have added great weight to Rattler being the must-read resource for everyone in the sector. Although the first issues of the magazine look completely different to the issues of today—the first issues were more strictly black and white, with a second colour on the cover to add a bit of class—the information contained within Rattler has always been high quality. Today, Rattler is a full-colour professionally designed publication and is available to be read on electronic readers, computers and over the internet. In the same way that we can’t imagine what Rattler will be like in 2037, it’s difficult to imagine what our predecessors would have imagined back in 1987. But the most important thing is that they imagined that Rattler had a future and could be used as a driving force for change in the sector, as well as letting the world know about the good work that was taking place, not just within Community Child Care, but within the entire early childhood field. It’s important for all of us to remember where we come from. Today, Rattler remembers its roots, from where it came from, and where it hopes to be. Let’s all remember this as we look towards the next 25 years and beyond. Rattler’s co-creator, Penny Ryan, now director of her own consultancy, joined Community Child Care in 1981. In 1985, she became the Community Child Care’s first official co-ordinator and began to generate income for the organisation by selling a range of publications from Australia and the United States. The only other early childhood journal at the time was put out by the Australian Early Childhood Association but Ms Ryan had a different vision for what it, Rattler, should be—i.e. ‘much more practical, more focused on quality issues and resources as well as advocacy’. Ms Ryan fondly recalls Rattler’s section called ‘My Working Day’ which would profile a childcare worker. ‘At that time, there was a lot of division between differently qualified staff and I loved having profiles that demonstrated how everyone made the centre work for children and families,’ she said. Jenepher Surbey, employed by Community Child Care as a project officer at the time, wrote several articles in Rattler’s debut edition in 1987. These days she is a business consultant but recalls how Community Child Care was an important advocacy training ground. One article that stands out was an interview Ms Surbey did with the then NSW Nurses Association General Secretary, Bronwyn Ridgeway, who likened many of the issues faced by childcare workers with those of nurses such as poor pay, stress and funding cuts. Ms Surbey also wrote a publication on occupational health and safety for childcare centres. Louise Brennan was the director of Carinya Neighbourhood Centre in 1987, and was later employed at Community Child Care Co-operative where she too penned several articles for Rattler magazine. ‘In 1987, I was a graduating “mature aged” teacher stepping into my first job in the lower Blue Mountains. Neighbourhood centres operated similarly to current day multifunctional children and family services. And Rattler and the NSW Community Child Care team behind it were true lifesavers. To make sure staff would read it, she recalls slipping Rattler into the middle of New Idea magazines. It worked! Rattler was distributed at low-cost, carrying information that was straight forward, with contributions from practitioners, academics, management and economists, she recalls. ‘Newly released books for staff and management committee as well as children, were reviewed. And endless campaigns for change were created, promoted and analysed through Rattler. Throughout the 25 years of policy shifts, and practitioner changes, Ms Brennan has moved in and around the sector undertaking a range of positions and roles. These days she works at Marrickville Council in Sydney co-ordinating early childhood services, where she says Rattler is as ‘an accessible and important publication that continues to provoke, affirm and agitate for change’.